Come in come in! I’m excited to show you! 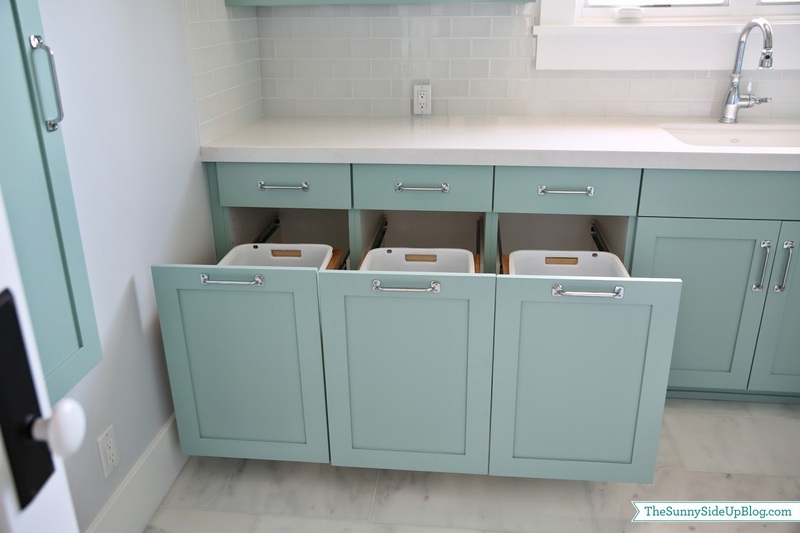 Three identical cabinets just like I put in our downstairs laundry room. Eventually I’ll label these (lights/darks/towels) but for now the girls just dump their clothes in them and we sort together when we do the laundry. I chose a white washer and dryer for this room. There was some space left on the side so I aded taller cabinets next to the washer/dryer. I’ll share how I’m organizing them at some point. Ok. On to the next issue that popped up with this room during building. 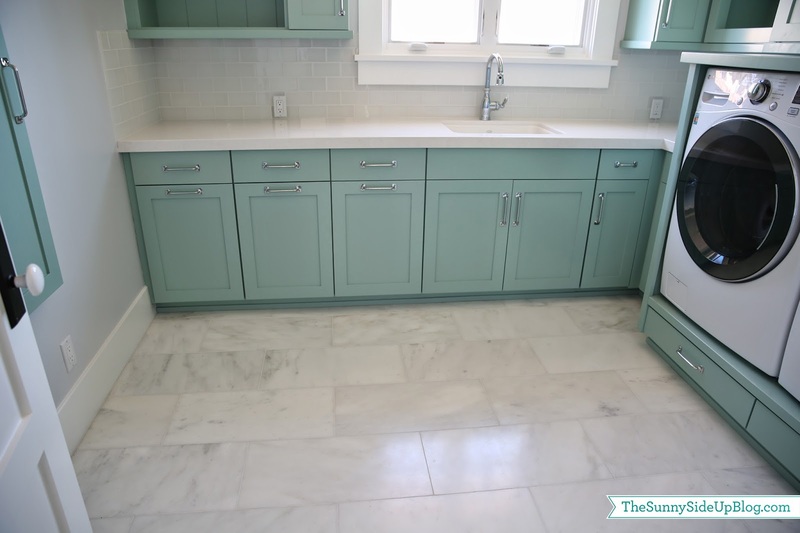 I originally wanted a grey tile floor but everything I tried to put with the green cabinets looked awful. So I chose an inexpensive tile that is supposed to look like marble. Our tile guys started laying it and when I came to see the floor I just hated it against the green cabinets. The grey veins were much darker and so busy. (I’m never a fan of too busy.) 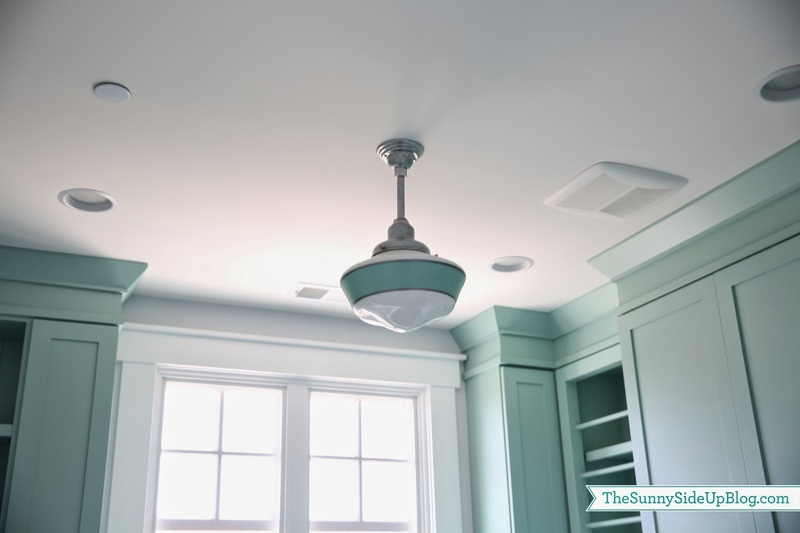 I felt like when I walked in the room my eyes went right to the floor and I wanted the cabinets to be the focal point. We have wood in the hallway that leads into this room so I thought about just putting wood on the floor but that was going to cost a lot more and I didn’t really want wood in the laundry room (especially the kids’ laundry room) in case of water spilling or leaking. We had just finished tiling the master bathroom with marble and had some left over (we accidentally ordered too much). So I brought these pieces up and laid them out and liked them so much more than the original tile. The tile is white glass subway tile. 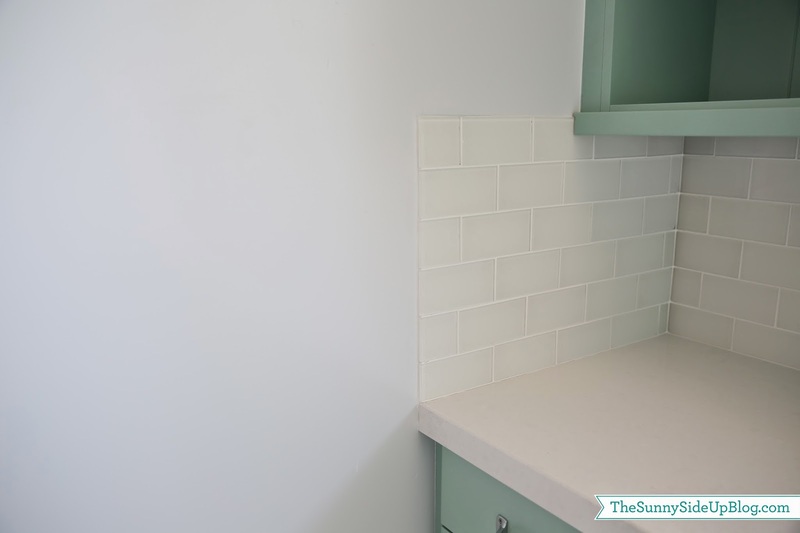 I used regular white subway tile in our downstairs laundry room so I chose the glass subway tile to add a fun shine to this room and mix it up. Counters are Quartz (Organic White) just like in our kitchen and the girls’ bathroom. Because the window wasn’t centered I had extra upper cabinet space on the left so I added some open shelves with planks behind them that will be fun to decorate. This window is the only window in our house that I didn’t put plantation shutters on. I might add a fun window treatment with some color at some point. Cabinet on the left side of the wall for a pull out ironing board. I put plug outlets inside of them and a shelf at the top so you can just keep the iron inside as well. And a pull down rack for drying clothes I don’t want to put in the dryer. I also added a pull out cabinet next to the washer/dryer for trash. So that’s it! Our upstairs laundry room. Several things didn’t go as planned with this space, but in the end I love the way it turned out. It’s a happy room that greets me at the top of our stairs each day and makes doing laundry not so bad. And now I’m off to finish that laundry. That’s sitting in piles in the hallway so I could take pictures of empty hampers. Erin, I would love one of those laundry rooms. 2? I would be in laundry heaven. Love the storage. Ohh that storage. I will be day dreaming about it as I go to my laundry-water heater-furnace tiny closet. :). I love the colors and all the organization! What’s in the drawers under the washer and dryer? 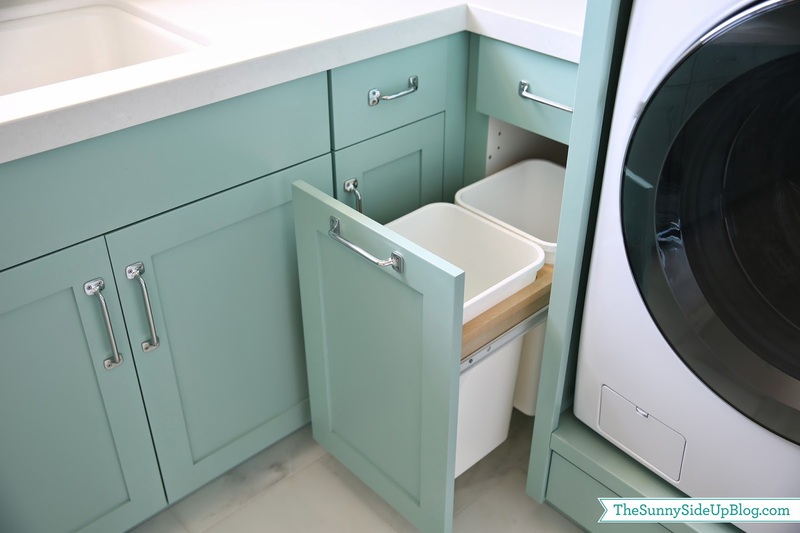 What do you keep in the thin bottom drawers below the washer and dryer? They’re cute! OMG. 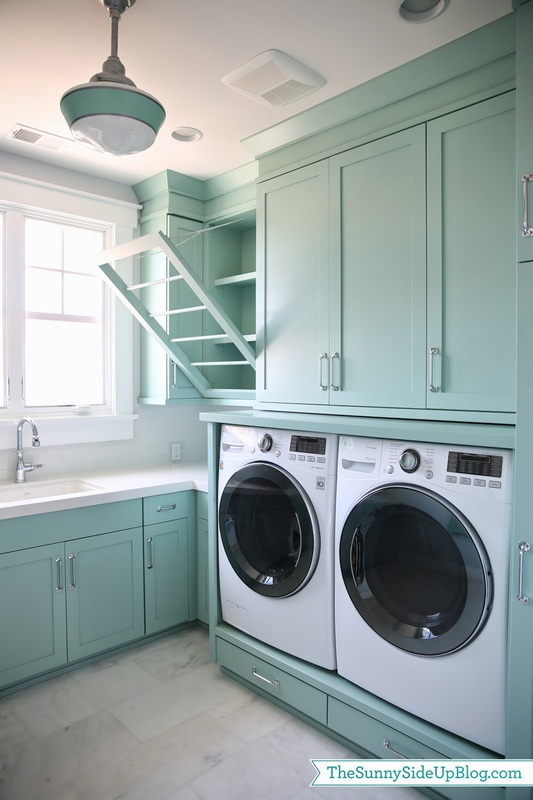 This is such a great laundry room. It makes me happy just looking at it. And you are very lucky to have one near your girls’ rooms. We moved in our house 10 years ago, and I still want one upstairs next to their rooms! Ha! (Our laundry room is in the basement, they’re on the 3rd floor.) Thanks for sharing!! The colors you chose are so soothing. I love all the details. It is gorgeous! I love, love, love the color. Makes me want to paint mine. I just wish our 1 was half the size of yours!! It is sooo tiny for a house our size. Definitely designed by a man. Beautiful, Erin. I agree with you on the real marble, it looks better with the paint color. I hope you Pin this. 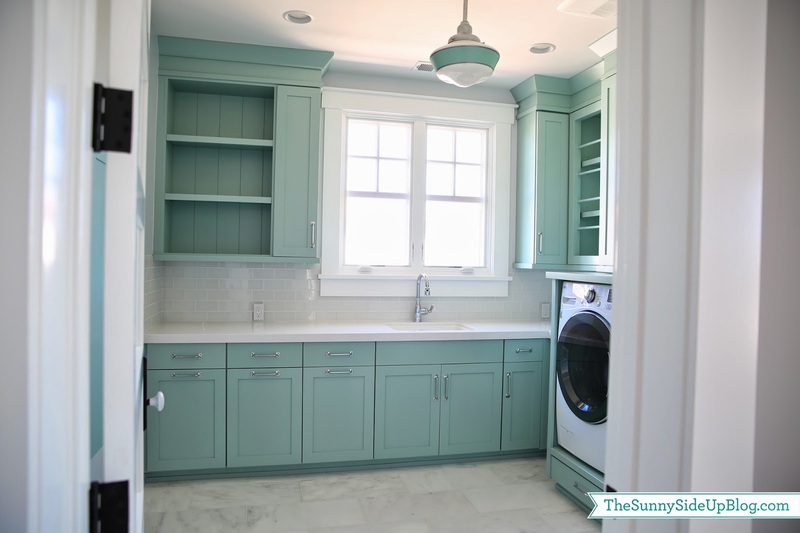 I sure need laundry room ideas. 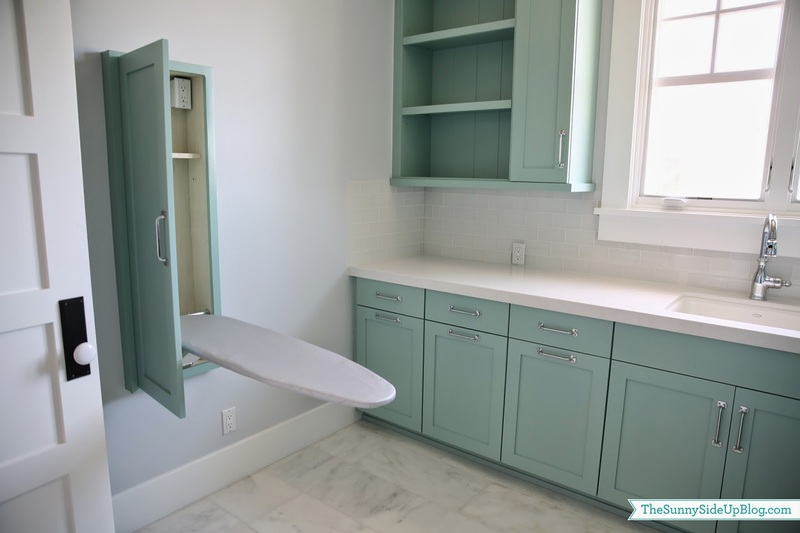 The ironing board idea is fabulous! I hate hauling out our ironing board in and out of the closet. Great job all around, Erin. There are so many great things about this room. I think the cabinet color is the best! Thanks for sharing! Every time I am shopping and see this color I always think of you! Love the room and color! Oh my gosh! I love this room!! 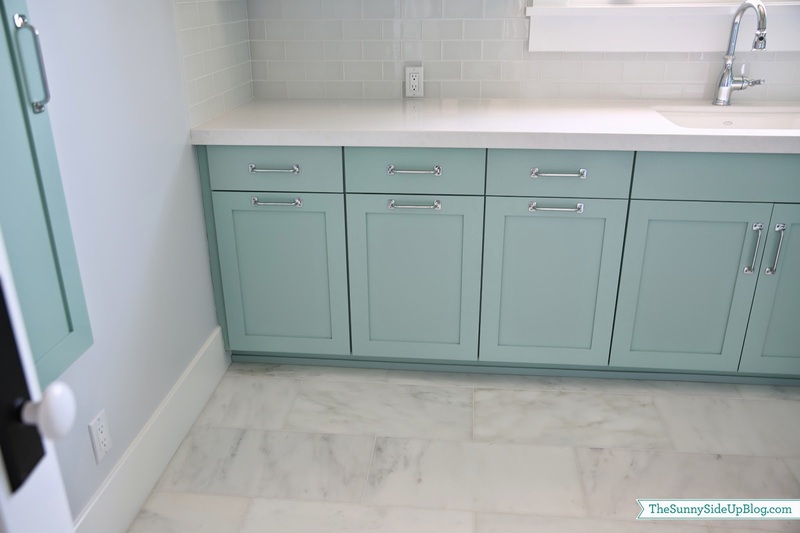 The cabinet color is so fun and cheerful!!! You have great taste Erin! I love that you think of everything like drying racks, hidden hampers, etc. 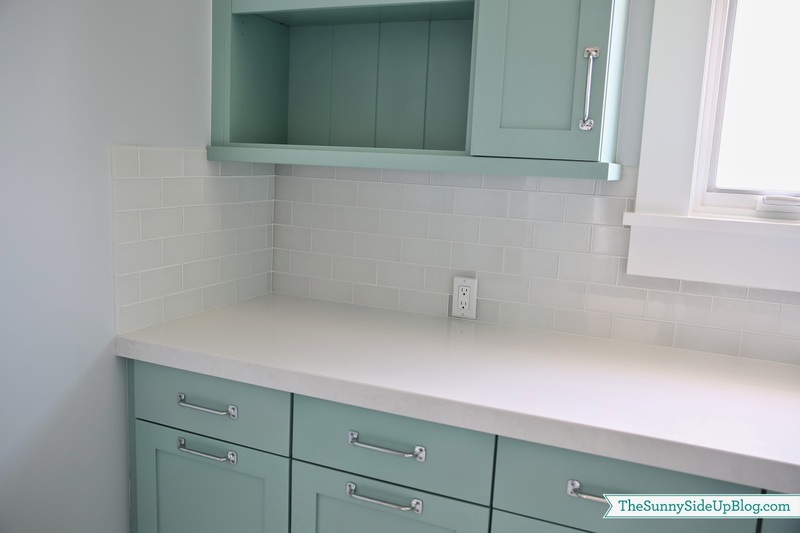 I love the color of the cabinets and I agree the first tile not good. I love your blog so much. Amy in Wisconsin. Having a large space with a window for natural light, and then designing it as well as you did with all the storage, drying rack, ironing board, etc. make every room in your house a visual pleasure to be in. You’ve done a great job knowing what you needed and wanted, and having an architect willing to incorporate it all. Smart ot have both an upstairs and a downstairs laundry room for a busy family. You must be very proud of your home. It should be HGTV Dream Home 2015! Wow! 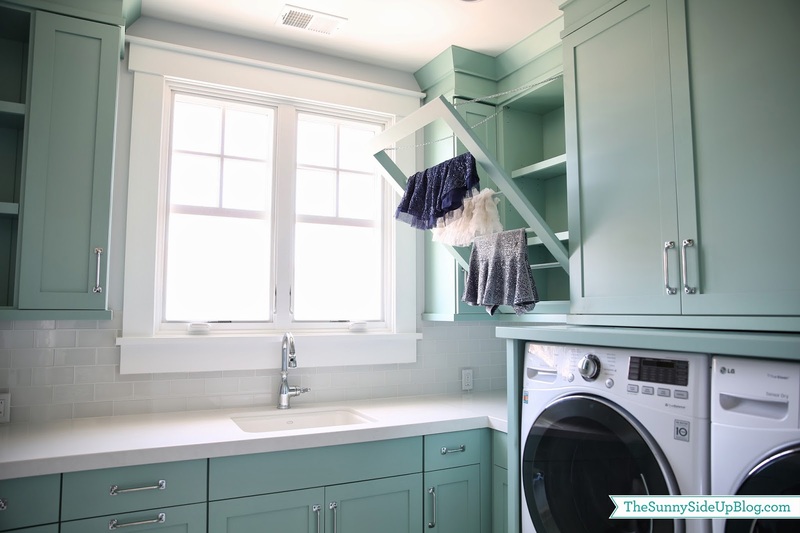 Most beautiful laundry room ever! Love it and the green color — so pretty! 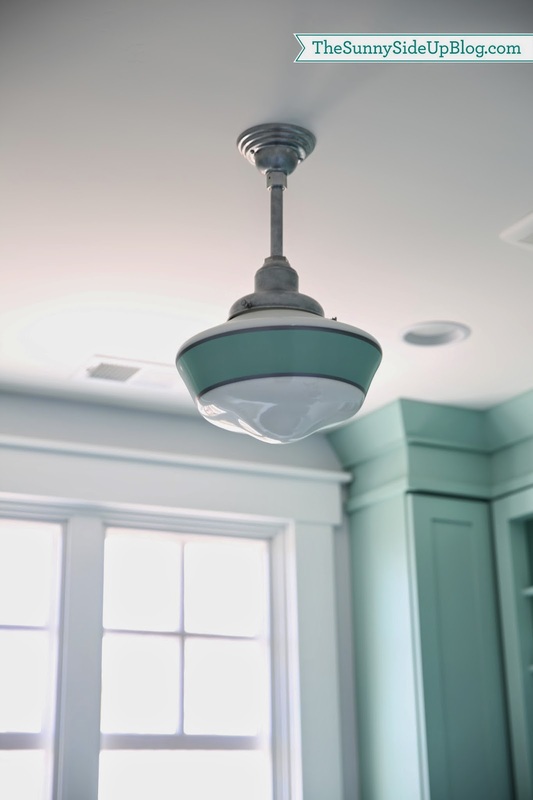 Very cool light fixture! Wow – so beautiful and fun! Our kids started their laundry at 16 with driving privileges :). Just sitting down for the first time tonight and what a treat reading all of your sweet comments! Thank you so much everyone! I’m truly so happy you like the space! Constance – Oh my word! I hardly think that. :) But thank you so much! oh my word – i cannot stop visiting your blog because posts like this very one utterly slay me! please never, ever stop sharing how you spend your time, talent and money. I want to die and be buried in this room. That is all. Oh Erin, I know so many have already said it but this room is SO great! I love everything! The colors, storage, and all the smart details you’ve put in there. I know it was a long hard process to pick and choose every single thing for the house but the results made it worth it. 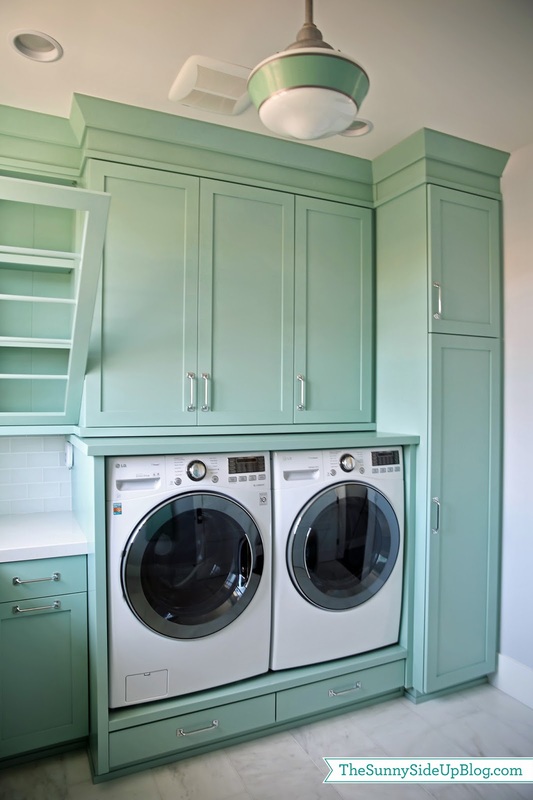 I absolutely adore your laundry room, how awesome to have one just for the kids!! Andrea – that laundry room is approximately 11×11 give or take a few inches! I just found this post from pinterest and now I need to spend many hours going through your archived posts, I love your style. 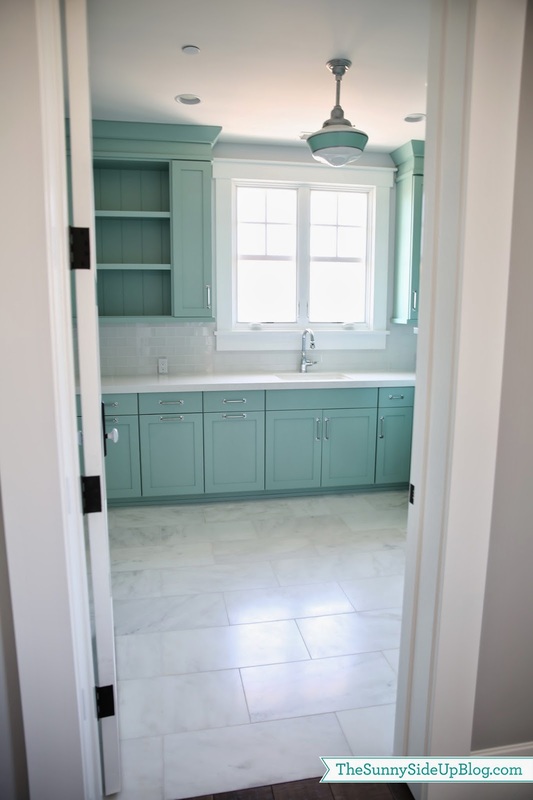 I’m wondering what brand of cabinets these are or if they are custom made. 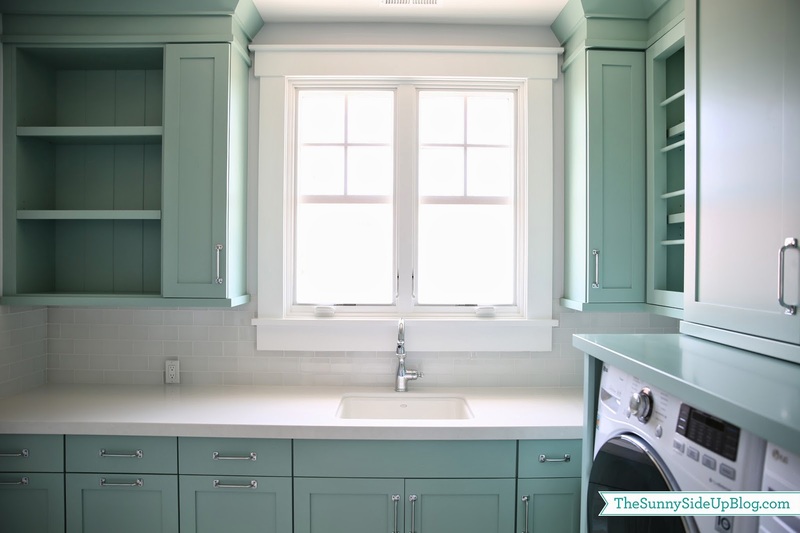 I’m in the beginning stages of creating an upstairs laundry room in our current house and haven’t found any cabinetry that has the laundry functions that I want (Pull out baskets, drying racks). TIA! I was wondering about the cabinets too! Where id you get them?? Hi Erin, I love your style! I thought I had read on one of your posts where you purchased the door/drawers hardware from. Of course now I can’t find it. Could you please share that? Thank you! Beautiful home. Can you tell me the dimensions of this laundry? 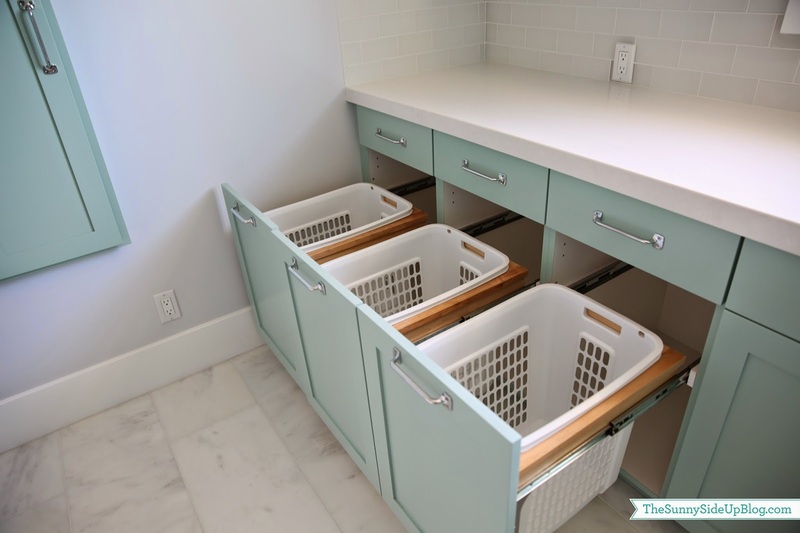 What are the dimensions of your pull out laundry baskets? I love this idea! Where did you find pull out hamper cabinets?? I must have these!! 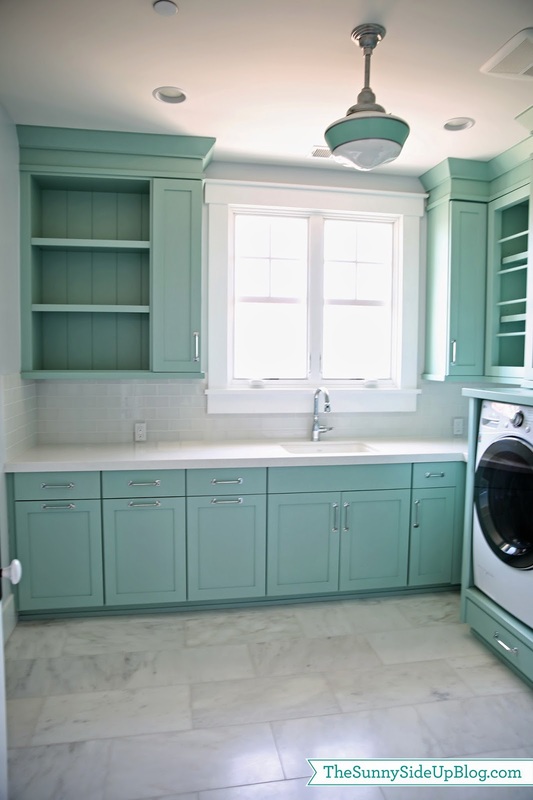 Hello, very nice laundry room. I love this one so much that I will inspire my laundry room from it for sure. Would it be possible to know the size of this room? Thanks a lot and continue your nice work. Forgot my question. I just sae that you answered in another comment! I’m looking to create the same laundry sorting system. Where are the baskets from? Did you just have your trim carpenter custom build the inserts they fit it? Beautiful room! Hi! 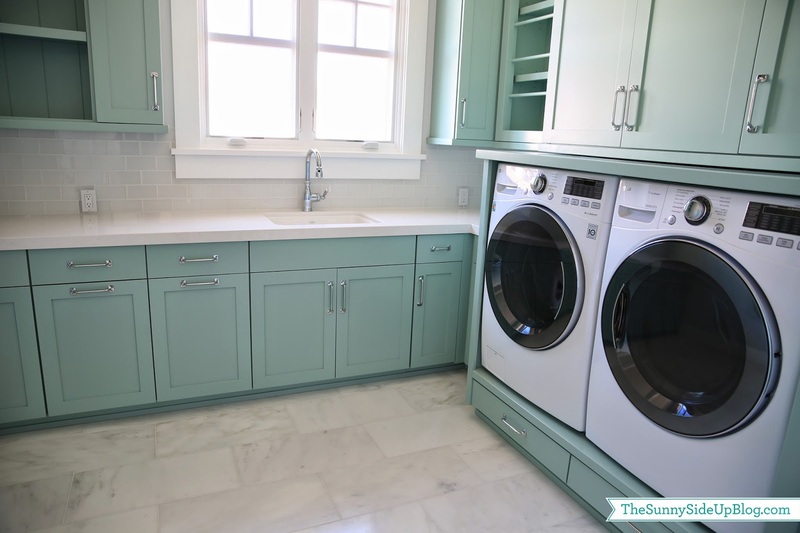 I realize I’m a little late to the party, but we are about to redo our laundry room and I have been looking at pics of them for weeks. I absolutely love yours! 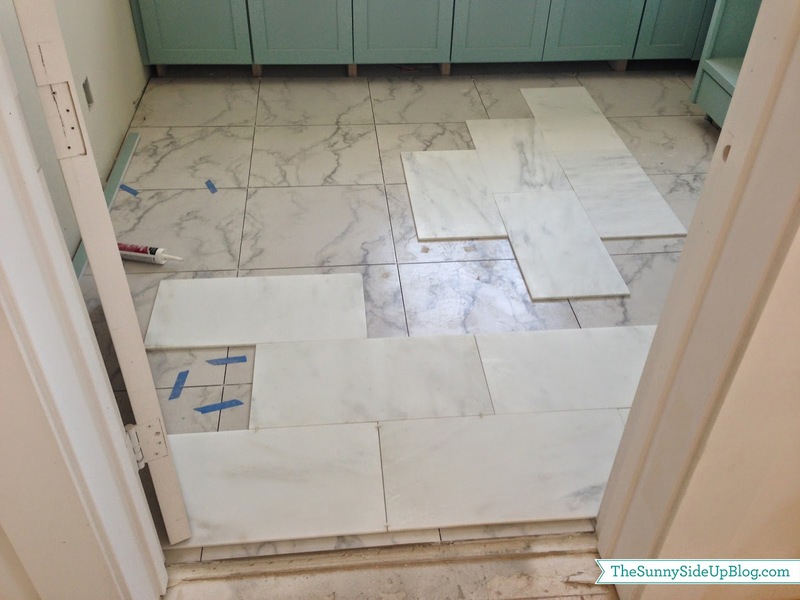 Is the flooring 12×18 carrara? My laundry room is about the same size and I have been having a hard time finding something that doesn’t look too big or too small. Thanks so much! I couldn’t have come across your blog at the most perfect time! 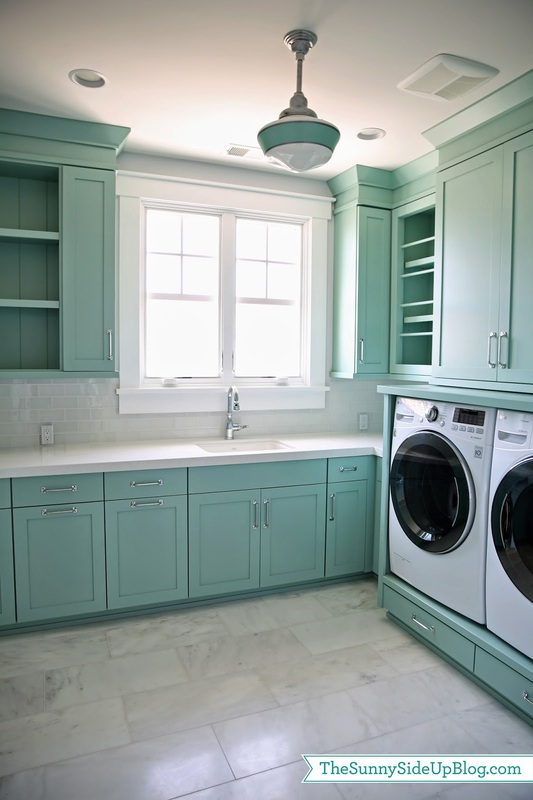 Your laundry room layout is EXACTLY the way I had in mind for ours that I’m sketching out right now. We’re in the process of building and I’m trying to get the room laid out on paper how I want it for our cabinet guy and your blog has shown me that it can work! I’ve seen your previous post on the room dimensions but was also hoping you would share the size of your trash can drawer & can size as well as your tall cabinet to the right of the W&D? How wide, deep, & tall is each section? 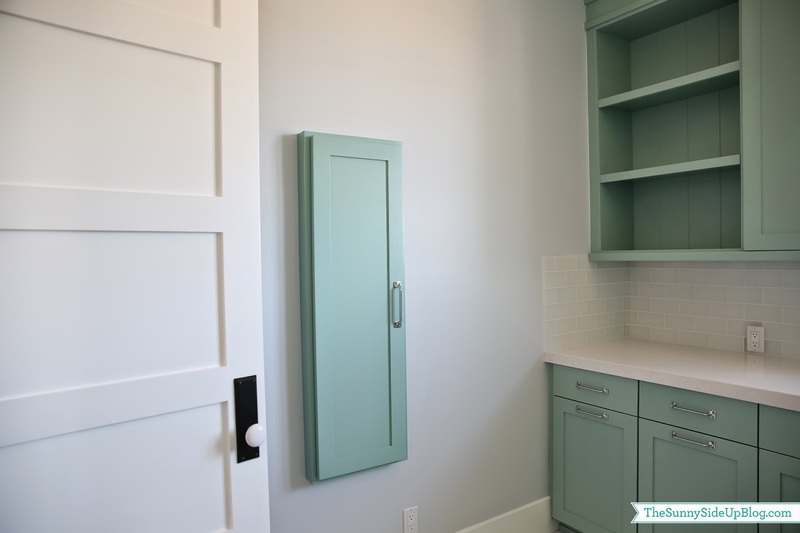 Do you use this tall cabinet for your broom/mop/etc.? Is it enough space if so? That’s what I was hoping to use it for. Thanks a ton for your help!! 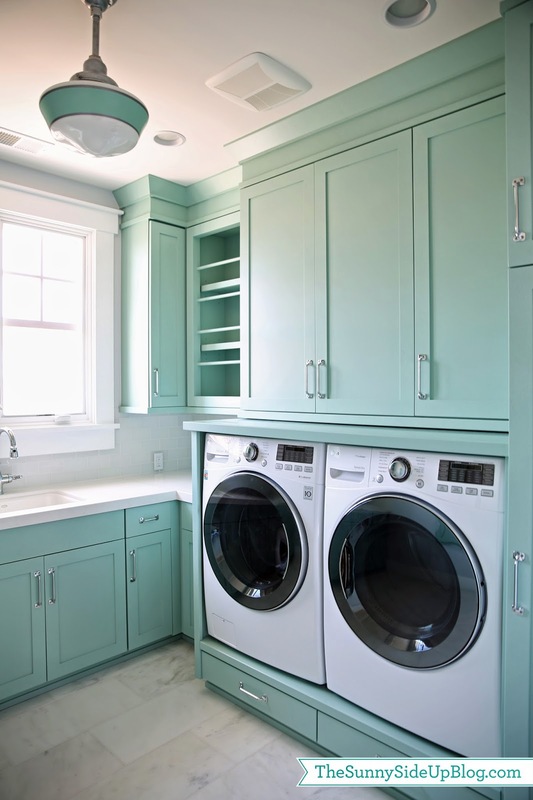 I love your laundry rooms! We are building a new laundry room in our basement and I want to recreate your pullout laundry baskets. What size are they? Where did you buy them? Did you have to have the cabinets custom built to fit them? How wide are all three hampers combined (if you measured all three cabinet doors). So I just read through all the comments and got the answers I was looking for. Thanks!! Fabulous job. Now, can you come to my house and help me get this look. I love everything about this room. I love this light! Which size do you have – 10″ or 14″?